My absence from Ye Blogge is partly due to rehearsals for A Midsummer Night’s Dream, in which I’m playing a female Bottom*. Also I’ve been watching people I know do amazing things and supporting my Pride In Them in its eternal war with my Bitterness and Jealousy (Pride is winning, but some days it’s a tough call). But mostly the rehearsal thing. This is one of those shows with a costume designer. Which is standard, I realize, but not in most of the gigs I’ve had in the last couple of years (to wit: ren faires). Plus, I hear she’s a good costume designer, which puts this show leaps and bounds ahead of the last show-with-a-costume-designer I was in (which I won’t talk about except to say that my costume was hideous and mostly constructed from hot glue WHILE I WAS WEARING IT). So I’m pretty stoked. Not having to worry about what I’m going to wear is a nice change. But since I have nothing to post about on this front, and I’ve been working on The Secret Project pretty much exclusively, I’m kind of at a loss. I mean sure, I could format and post any of the dozens** of Dressing the Character profiles I have hanging around the ol’ hard drive, but I don’t like to be predictable, so I don’t do what I’m supposed to do. Which in turn becomes predictable. Elmer’s Glue is black now, BTW. The bottle said “Dries clear!” The bottle lied. Full masks make me feel a little like I’m going to suffocate at any given second omfg get it off get it off, so the director cut me a quick half-mask out of construction paper. I was a little confused at first, because what do you mean what does Bottom look like? Bottom looks like me, except when Bottom looks like a donkey, which I’m trying not to think about because Bottom doesn’t realize she’s a donkey. But I plunged ahead, picked up a brown marker, and started to color some hair, and was suddenly struck with inspiration. My Bottom is a wannabe social-climber, a pretender to knowledge and talents she doesn’t necessarily possess. Her beauty ideal would be the same as that of the court! So I dove into my knowledge of Elizabethan makeup and came up with what you see here. 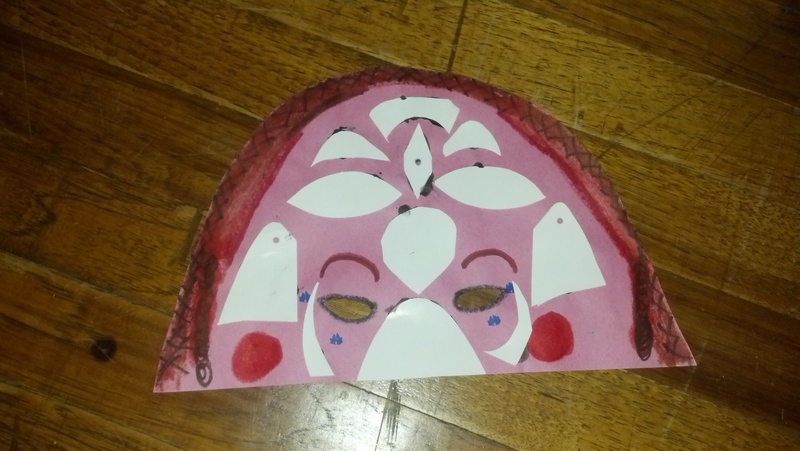 I was so glad the construction paper wound up being pink, because it allowed for a really obvious attempt at white face (made with scraps from the masks of the higher-status characters). I finished coloring the brown hair, then colored the red over top like a bad dye job. The eyes are lined in kohl. I did my best to give the impression of a high forehead, but I obviously can’t draw, so that didn’t happen as much as I would have liked. Then I found one of those stamp markers in the shape of a castle, put four of them on the front of the mask as representations of dreams, and went to town on the back. Also, stars. And hearts. Because Bottom is dreamy. But I forgot to take a picture of the back. Even my lack of any sort of ability to make good art wound up working, because Bottom is a creature of enthusiasm, not talent. Ultimately it was an interesting and helpful exercise. To be honest, I was surprised at how much I enjoyed it and how much it helped me learn about the character.